Ivy was born in Lafayette, Louisiana in 1948 and has been playing Cajun music since he was 12 years old. He, along with his group, Jackie Caillier, Ivy Dugas and the Cajun Cousins, have been dominators at the Cajun French Music Association’s Le Cajun Awards year after year. Along withBand of the Year, Album of the Year, and others, Ivy has been named Vocalist of the Year six times! With all of Ivy’s success, it had been at the back of his mind to do something a little different… something he didn’t do every day. At his fans’ requests, he decided to release an album of pure Swamp Pop music. He was very proud to have his son, Timmy, join him in the endeavor. 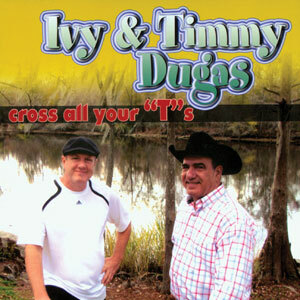 The son of Ivy and the brainchild of Zydecane, Timmy Dugas usually spends his time performing high-energy Zydeco music with his group. There’s always a taste of Louisiana there, so joining his dad in this Swamp Pop project was an easy transition. A musical family, they truly enjoy spending time together, even performing at “the happiest place on earth,” DisneyWorld. Timmy has been playing music since a young boy and has never stopped. Over the years, he’s performed for countless musicians, such as Percy Sledge, The Platters, The Drifters, Sammy Kershaw, Wayne Toups, Hunter Hayes, and many, many more. A hard worker, Timmy is a veteran of Phantom Regiment Drum Corp as well as Suncoast Sound Drum Corp. In his spare time (as if there is such a thing), he teaches drum camps in the summer as well as drum lessons in his home town.